The Newcastle United defender collided with Georgia’s Jemal Tabidze midway through the first half which led to a five-minute stoppage during Switzerland’s 2-0 win. Schar played the remainder of the match despite admitting later he was “out for a few seconds” and could not remember anything about the incident. “When a player is unconscious he should immediately be removed from the pitch and should not return,” FIFA’s medical committee chief Michel d’Hooghe told Insideworldfootball. Swiss medical examiners insisted that Schar was ”awake and oriented” when they arrived on the scene. Yet 24 hours after issuing a statement defending their assessment to let him play on in Georgia, he was withdrawn as a precaution from the subsequent fixture against Denmark. 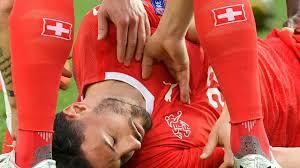 In Schär’s case there was a five-minute break before the referee was reassured by Switzerland’s team doctor that the player had recovered sufficiently to continue. The case rekindled memories of an incident at last year’s World Cup where strict FIFA guidelines were ignored by Morocco winger Noureddine Amrabat who refused to be substituted against Iran. He was then being picked to face Portugal just five days later despite suffering memory loss and spending one night in hospital. Although Schar didn’t play against Denmark, d’Hooghe said he should never have carried on against Georgia. “You cannot be careful enough especially in that acute moment because there are long-term consequences. You should never under-estimate concussion. You have to be very, very, very careful.